At Christmas, The Swedish Smörgåsbord Redefines Over The Top : The Salt First rule of smörgåsbord: Pace yourself. You've got to make your way through dozens of dishes — fish courses, ham, cheeses, warm entrees. And don't forget dessert. Or should we say desserts? 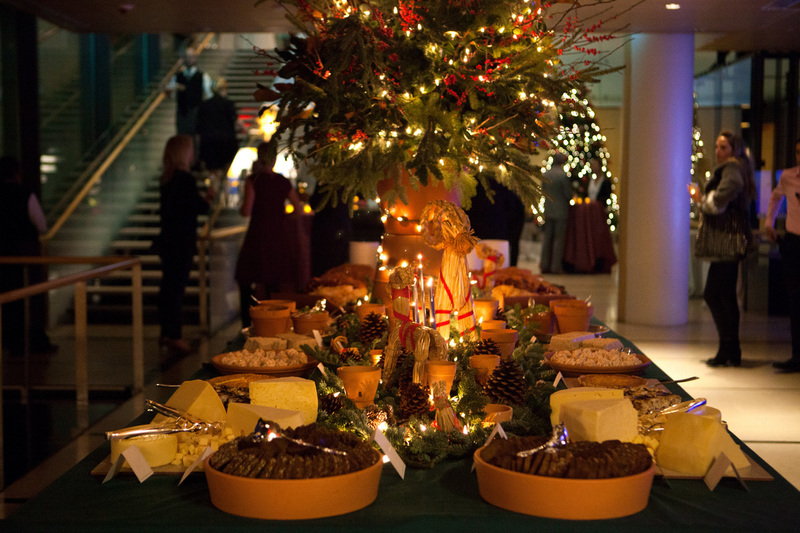 A smörgåsbord at the Christmas party held at the Swedish Embassy in Washington, D.C. this year. The smörgåsbord was introduced to America in 1939 by the Swedish delegation to the World's Fair. The holiday version of the meal, called a julbord, is traditionally served on Dec. 24 and features an endless array of fish, bread and cheese, cold meats, hot dishes and dessert. Ask any Swede and they'll tell you that a smörgåsbord table without herring is (gasp) unthinkable. While there are other foods they may rattle off as equally important — gravlax, cured ham, meatballs and rice pudding — it's these tiny, pickled fish that are the backbone of the elaborate buffet, which likely traces its roots back to high-society gatherings in the 1500s. The spread was smaller then, and was called the "aquavite buffet." Since people were traveling long distances, it was a way to entertain guests, mostly men in earlier times, while waiting for stragglers. A separate table was set up in a side room with savory bites that could be enjoyed while standing along with glasses of aquavit — made from potato or grains and cured with herbs like caraway, dill, fennel, coriander and anise. Johanna Kindvall, writer and illustrator of the book Smörgåsbord, says it's possible the tradition was borrowed from the Russians who liked to mingle around eating caviar, herring and vodka. That snack grew into a meal — and that meal grew into what it is today: a smörgåsbord, a table set with seemingly every iconic dish known to Sweden. 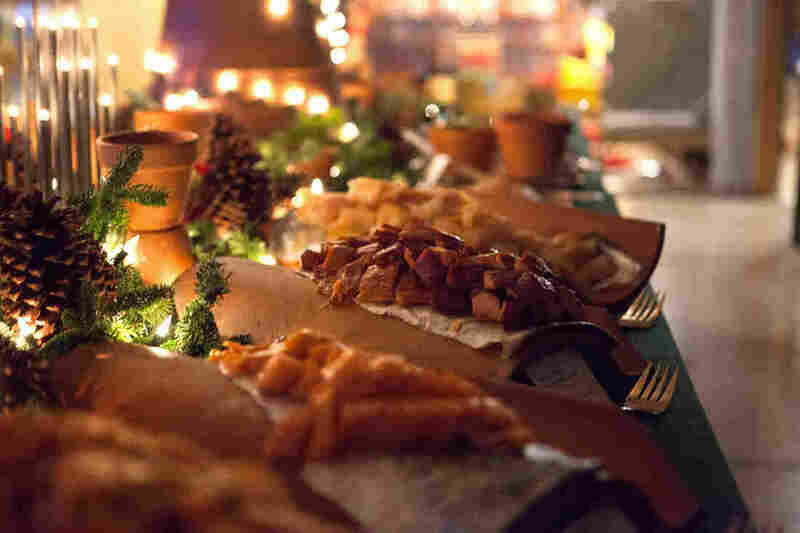 First introduced to America by the Swedish delegation at the 1939 World's Fair in Flushing, Queens, the smörgåsbord meal is traditionally served on Dec. 24, when it's called the julbord — or Christmas table. Over time it extended its reach and became the default celebratory meal served at holidays like Mother's Day and Easter, at hotels, in train stations and restaurants, and of course, the home. If you're lucky enough to get invited to a traditional smörgåsbord meal, you should know that there are as many rules as there are dishes. If you're Swedish, these rules are instilled from a very early age and are as instinctual as breathing, or the umlaut. Long tables are buried under a sea of plates — sometimes placed at different heights to accommodate the sheer number. Your job will be to approach it with the restraint of someone who can take food or leave it, even if you're like me: a cured-fish fanatic. A seasoned smörgåsbord muncher will tell you: start with the herring. At the Swedish embassy, there were at least eight different herring dishes — from basil-lemon to vodka cucumber — laid out on this table. "The trick is to take it easy, because if you overload [your plate] you don't get to the fourth course," says Kindvall. The rules are here to help. You start with herring and cheese, then dabble in seafood, gravlax, crawfish, shrimp and fish paté. The third round is cold cuts, ham, sausage, paté, salad and pickles and the fourth is warm dishes, meatballs and Jansson's Temptation — a potato casserole with cured sprats (a forage fish-like herring). And then there's dessert. Who has room for dessert? 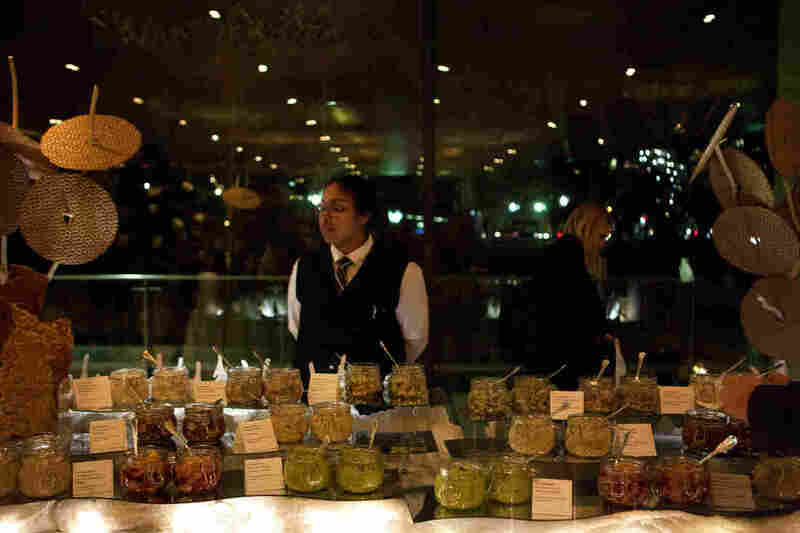 At the Swedish embassy in Washington, D.C., which hosts an invitation-only Christmas table for 1,000 guests every December, chef Frida Johansson (and her team of one) begin prep work two months ahead of time. First up is glögg, a traditionally red drink that Johansson reimagines as a white drink. (No red drinks are allowed in the Embassy due to the white flooring.) Despite the heavy workload come December, the chef loves her job. "I came for one year and seven years later I am still here," she says with a laugh. While Americans agonize about holiday shopping, in Sweden they're too busy cooking. "We spent the whole December preparing for the feast," says Kindvall, recalling her childhood. 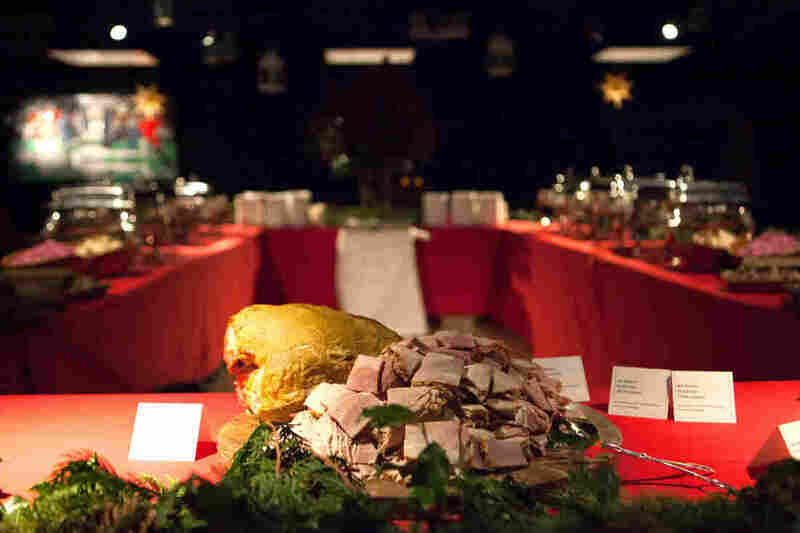 Ham is often considered a star of the julbord, seen here at the Swedish embassy. Aquavit chef Emma Bengtsson says as a child, she loved her mother's Christmas ham: It was "really, really good. Other people would say it's dry as hell and overcooked, but that's what I grew up with. I can't eat it any other way." This was a recurring theme. Emma Bengtsson, the executive chef of Aquavit, a Scandinavian restaurant in midtown Manhattan that hosts an often sold-out series of weekend smörgåsbord meals, told me, "It's pretty much a month of cooking. I just got off the phone with my mom this Sunday and she already started cooking for Christmas." The chef chuckled. It was Dec. 3. Bengston's elaborate preparations borrow heavily from her time working at Operakällaren, a Swedish restaurant that opened in 1787. The renowned restaurant is famous for its own meal, which is displayed on a special bronze table made just for the occasion. The wow effect is real. Hakan Swahn, the owner of Aquavit, which just celebrated its 30th anniversary, has equally fond memories of his mother's month-long efforts. "It was very, very ritualistic. She pickled her own herrings, baked her own cookies and cake, and ham from scratch. As a child you always remember the whole procedure and you can't wait until Christmas because you can't eat anything beforehand." Like Bengtsson and Kindvall, he said his favorite dish was the ham. This year's julbord at the Swedish embassy offered eight types of herring, 11 kinds of fish and cheese, 14 warm dishes, and finally, a diet-killing 30 desserts. One more reason to moderate your eating as you make your way through the julbord: so you last until dessert. "It's a lot about the little candies," says Bengtsson, who served as Aquavit's pastry chef before ascending to executive chef. Think fudge, chocolate and marzipan. And then there are the cookies — so many cookies: almond, gingerbread, caramel and chocolate — the list goes on and on. This is true in general, but outside of the home, at high-end restaurants like Aquavit, it is especially vast. The showstopper is a rice pudding called risgrynsgröt made from Arborio rice, cinnamon, vanilla and whole cream. "I never understood it, but it's quite delicious," says Kindvall, of the over-the-top rich dessert after an already over-the-top meal. Pace yourself: You'll want to leave room for dessert. 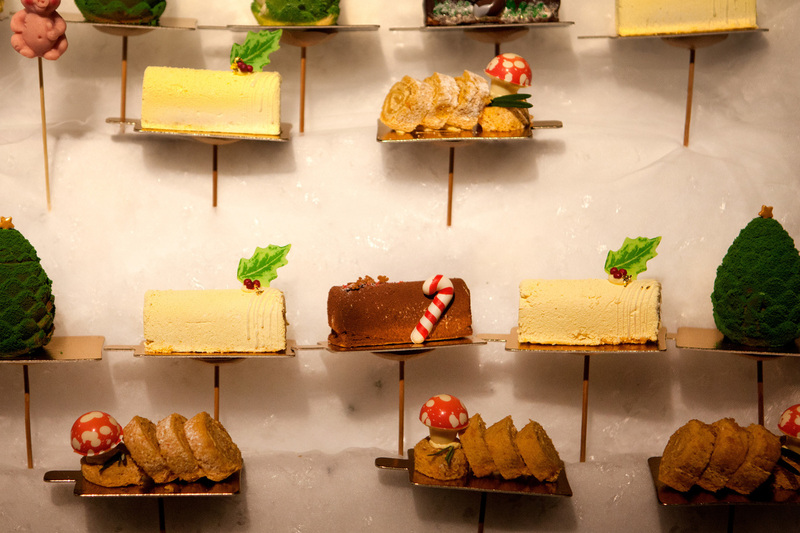 Or should we say desserts? So next time you find yourself saying the word "smörgåsbord" to convey an extravagant array of foods, remember: It's not really a smörgåsbord unless it begins with herring and ends with ham.